I went down the Cape last weekend and mounted the bamboo vase I got at the high school crafts fair this winter. Thought you might like a pic--doesn't it look great? Although you can't see it, it adds the finishing touch on a deck we built last fall. When I saw the vase at the fair I instantly knew where it would go. Welcome to Serenity Bamboo Flutes. 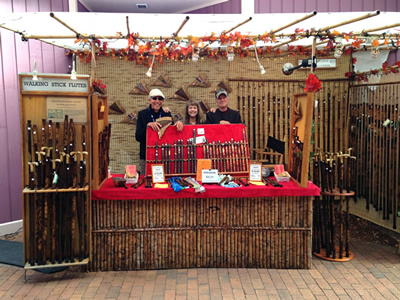 For the past 40 years our small family business has been making and selling our distinctive style of dark bamboo flutes, walking sticks, and walking stick flutes at juried craft fairs and music festivals throughout the northeastern United States. All of our bamboo flutes and walking sticks are made by us at our home in the beautiful rolling hills of Stockbridge, Massachusetts. We were the first to develop and sell our amazing walking stick flute, which has been featured in a number of publications including Signals catalog, Real Goods, and Backpackers Magazine. Our Bamboo Flutes and Walking Stick Flutes are side-blown Flutes, played sideways like a metal concert Flute. For a quick lesson on how to get a strong, clear tone on a side-blown Flute, please go to our How To Play a Bamboo Flute page. We Individually Concert Tune each Bamboo Flute and Walking Stick Flute to a major scale. They have a rich and mellow tone and are great fun when played along with other instruments. Free Playing Instructions are included with each purchase of a Bamboo Flute or Walking Stick Flute. You will find that our prices, which include shipping, are very reasonable. This is due to our more than 40 years experience making bamboo flutes and walking sticks. We also Unconditionally Guaranteed all of our products for one full year. If you are not completely satisfied with your purchase, for any reason, please return it for a replacement or refund. Customer satisfaction is very important to us. Please take a moment to peruse our site. If you have any questions please call our toll free number 877-582-2854. Create a truly unique, one of a kind Bamboo Flute or Walking Stick! My wife Linda can engrave and hand ink a personal design, name, initials, or even a short inscription on any of our Bamboo Flutes or Walking Sticks. Or you can choose one of Linda's many hand inked Original Designs. We individually handcraft everything that we sell and can accommodate any special requests that you may have. In the past we have made Bamboo Flutes for people missing fingers and for those who needed a certain alignment of the finger holes for comfort. If you like, we can also leave the bamboo in its natural finish. Dark Glossy Bamboo Flute has a beautiful tortoise-shell-like exterior finish. Starting at $20.00 Shipping Included! Hand Inked Bamboo Flute is engraved and hand inked in full color with your choice of design. 'Serenity' Chinese Bamboo Flute has a dragonfly and the Chinese characters meaning 'Serenity' engraved and inked in gold. 48 inches (122 cm) long with a 3/4" (20 mm) liquid compass inlaid into the top, a leather hand strap and replaceable heavy rubber tip on the bottom. Walking Sticks can be cut longer or shorter at no extra charge. Also available as a Walking Stick Flute. Starting at $30.00. Shipping Included! 36 inches (92 cm) long with a solid brass handle (choice of four styles), a leather hand strap, and replaceable heavy rubber tip on the bottom. Walking Canes can be cut longer or shorter at no extra charge. Available as a Walking Cane Flute. Starting at $49.00. Shipping Included! 52 inches (132 cm) long with a brass ball on the top, leather hand strap, and replaceable heavy rubber tip on the bottom. The brass ball unscrews from the monopod to reveal a standard camera mount. There is also a metal spike hidden in the bottom of the monopod walking stick that can be used to take selfies of you and your friends when you're out and about in the world. Monopod walking sticks can be cut longer or shorter at no extra charge. Also available as a Monopod Walking Stick Flute. Starting at $56.00. Shipping Included! Approximately 14"(35cm) long and 1 1/4" (3cm) wide. Use our dark bamboo Wall Flower Vase alone or in combinations to create beautiful wall arrangements. Starting at $9.00. Shipping Included!